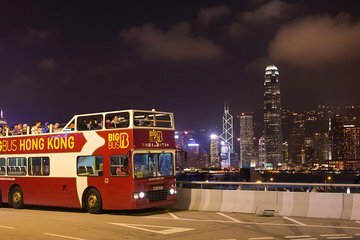 Enjoy an evening under the city lights during this one-hour Big Bus Hong Kong tour on a double-decker open-top coach. Explore Kowloon and check out highlights like the Victoria Harbour’s illuminated Symphony of Lights and neon displays on Nathan Road. Hop off anywhere along the way to check out the sites up close. A well-marked map means you’re sure to find your way! Kick off this memorable evening at Kowloon’s Central Ferry Pier 7 or Tsim Sha Tsui East Promenade. Settle in to your seat aboard an incredible open-roof double-decker bus and prepare to experience the sights and sounds of Hong Kong. Venture past the Coliseum and make your way towards Nathan Road as you listen to onboard commentary. Check out the neon lights that line the famous street and take in the riot of color that is sure to assault your senses. Travel past the Harbourside and Kowloon Park and snap photos of the impressive Hong Kong skyline as it glitters in the darkness of evening. Exit the bus as you wish to explore the markets and madness that make Kowloon come alive at night. With map in hand, wander the Temple Street Night Market, where you can sample local street food or barter with vendors. Choose to stay on board the entire hour and leave your tour at Tsim Sha Tsui East Promenade, where a popular Symphony of Lights show, complete with colored lasers dances across the buildings at Victoria Harbour. This tour was awful. There was no stop to see a panorama of the harbour, which was the reason I selected this tour in the first place after reading your description, and there was no information about what was happening. The highlight was getting the Star Ferry back to Central from Kowloon, and I arranged that myself. It was not worth it at all. It was basically a very expensive bus ride and to top it off, we actually took a cab to the central pier to board. The last drop off point was not where we were picked up so end up having to find our way to the metro and find our way back to the hotel. Exciting seeing all the markets and the busy life at night. Enjoyed sitting back and taking it all in.